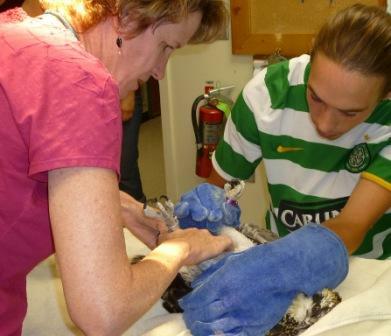 Five osprey chicks visited TRC’s clinic this afternoon. 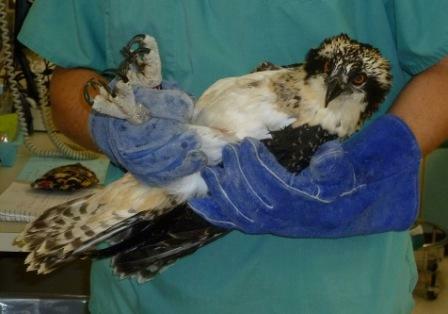 They are a part of the osprey restoration project in Iowa (read below for story). 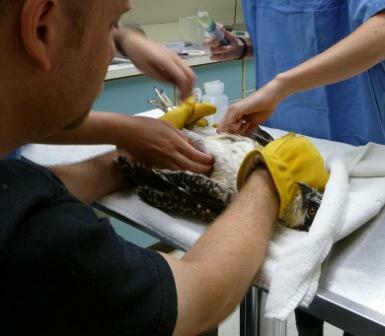 They were checked for overall health, feather condition, and external parasites such as maggots or lice were removed. They were then given a fish meal, and continued on their way to Iowa. Photo 1: Osprey chick done with an exam. 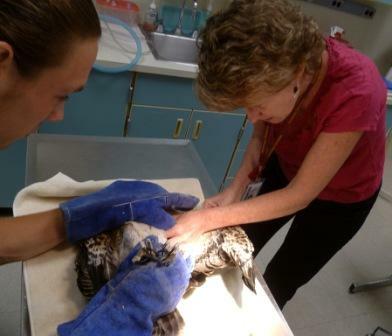 Photo 2: Dr. Ponder checks a wing. Photo 3: ear openings are checked for parasites. Photo 4: Dr. Ponder is feeling the leg bones to check for injuries. 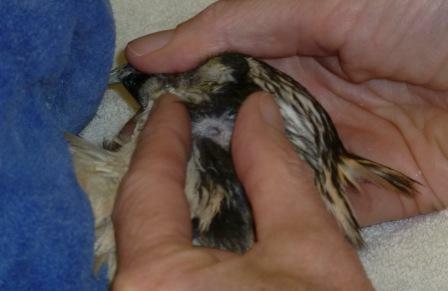 Photo 5: To prevent dehydration on the trip, the chicks were given subcutaneous fluids. Historically, there were numerous Osprey summer sightings in Iowa, but apparently these young, non-breeding Ospreys returned to areas where they were reared for mating and nesting. During the last 20 years, the number of migrants through Iowa has increased as breeding populations to the north have grown. Despite this population growth, Ospreys have demonstrated little breeding range expansion. Minnesota and Wisconsin DNR officials suggested that Ospreys do not readily pioneer new breeding ranges. Instead, they experience suppressed reproduction as density of nesting pairs increase. To address this issue, young Ospreys from Wisconsin and Minnesota began being relocated to areas with suitable habitat in Iowa. Approximately 42-day-old Ospreys from Minnesota and Wisconsin are relocated from nests where more than one young exists. After a check-up at The Raptor Center, the birds are driven to release sites and placed in carefully constructed release towers or "hack sites." Hack sites are predator proof 8' x 8' x 8' structures with bars on the front that provide visibility of surroundings. The bars are opened when ospreys are released. Trained volunteers feed the young daily in such a manner that the birds do not imprint on people. By quietly viewing ospreys through one-way mirrored glass or from monitors, detailed observations of each bird's temperament and condition are logged daily. When Ospreys are approximately 53 days of age, they are full-grown with rapidly developing feathers and are ready to be released. The birds are actually heavier than they will be as adults, due to built-in fat reserves until self-sufficiency is achieved. Great care is exercised to ensure that young are not startled into their first flight - at this stage of the young Ospreys’ development, the less disturbance or drama, the better. After the Ospreys fledge, volunteers supplement the birds’ diets with fish at the hack site, until birds begin fishing on their own and self-sufficiency is achieved.